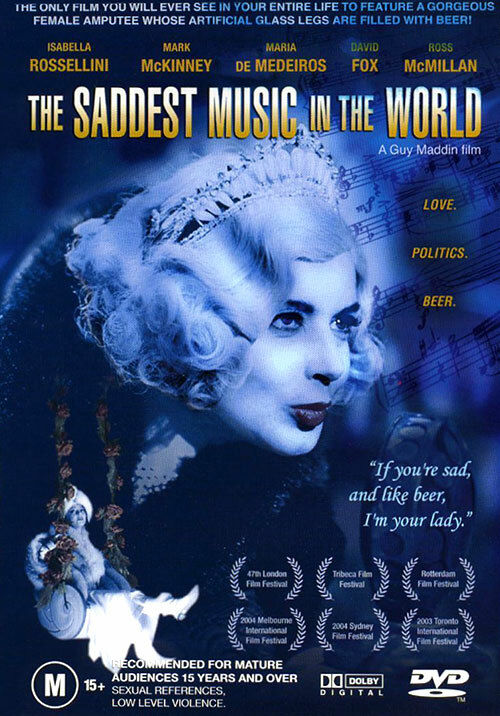 In 1933, in Winnipeg during the American Great Depression, the legless baroness of beer industry, Lady Helen Port-Huntley (Isabella Rossellini), promotes a contest to choose the saddest music in the world and find where the real drinkers are. People come from all parts of the world, including her former lover Chester Kent (Marc McKinney) representing USA with the nymphomaniac amnesic Narcissa (Maria de Medeiros); his brother, who misses his dead son and his vanishing wife, Roderick Kent / Gravillo the Great (Ross McMillan), representing Serbia; and his father and the man who sever her legs in a car accident, Fyodor Kent (David Fox). During the competition, Roderick finds his wife. During the competition, Roderick finds his missing wife. 0 Response to "The Saddest Music in the World (2003) Guy Maddin"